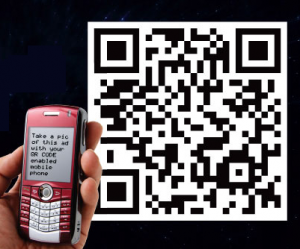 What are QR codes? Well, they’re similar to the barcodes used by retailers to track inventory and price products at the point of sale. The main difference between the two is the amount of data they can communicate. Traditional barcodes which I’m sure you’re familiar with use vertical lines and can only hold up to 20 digits, whereas QR codes are two-dimensional (2D) and can hold much more information. Really it makes it EASIER for a customer (or potential customer) to obtain further information about a product – WITHOUT having to enter in information (e.g. your website address). It’s a good fashion marketing and sales tool. I’ve recently seen a big goods retailer use QR codes as a ‘teaser’ for advertised specials. So it will be interesting to keep tabs on the varied (and creative) uses for QR codes in fashion retailing and business. Why do I say you need deep pockets to run this fashion advertisement? Someone has paid a large sum of money $1,000 or more to run this advertisement to ‘brand’ their clothing label and fashion business. This "image" style of advertising, unless run frequently (at a significant cost), often will not have an impact to the sales of the fashion business. Deep pockets = lots of money wasted … ouch!